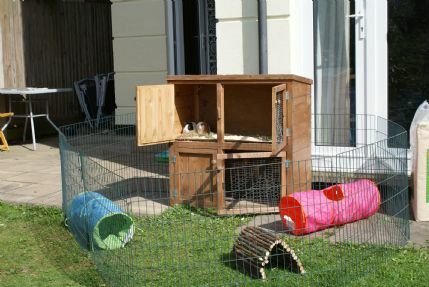 Indoor and outdoor home from home boarding facilities. We have tunnels and hidey holes galore for our fuzzie friends. Overnight in a secure heated brick built summer house, and rabbit runs in the daytime in the garden, constantly supervised. We have indoor and outdoor play pens for our friends with lots of activities to keep them occupied. All washable surfaces cleaned daily and cages cleaned as often as is necessary for your pet. You are welcome to bring your own cage if preferred. Most cleaning products are provided by Henderson Hygiene and are pet friendly. All bunnies must have myxo and VHS 1 and 2 jabs within the last year. Own water bottles and food bowls must be provided. We also have rescues on site who may be skittish and shy, please be calm around them as we nurse them back to health. Donations welcome and 20% of boarding fees go towards our rescues before rehoming them. General grooming for all pets and claw clipping for Guinea Pigs - free as part of our service. Free guinea pig nail cutting for non boarding guinea pigs. Pop along with your piggies and we will clip them for free and show you how.